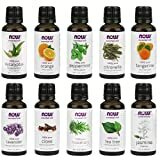 Essential oil kits are a great way of learning how to incorporate the therapeutic benefits of these incredibly powerful essential oils into your daily life for the maximum effects on your health. They are also a great gift for someone you know who loves different scents and aroma products and could benefit from the therapeutic, healing, or calming effects of essential oils. 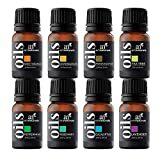 Although every person has their own favorites, most people agree that there are several oils which should be included in every essential oils kit, whether it is for beginners or experts. Although experts generally purchase their essential oils individually, in larger bottles. 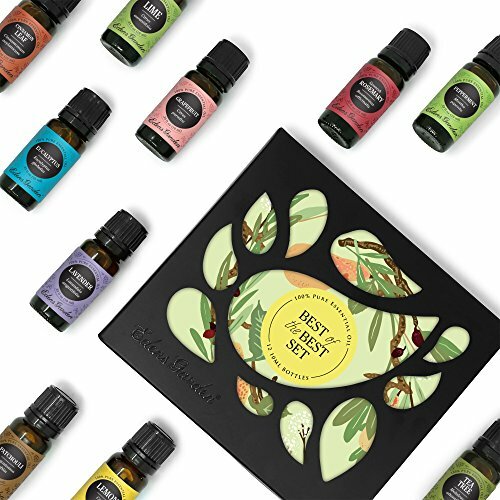 Gift boxes or sampler essential oil kits differ in size and quality and are a great way to start or increase your knowledge of essential oils. This article reviews the best of all the Essential Oil kits readily available and what you should know before making a purchase. 1. What Are Essential Oil Kits? An essential oil kit gives you all you need to start using distilled therapeutic flower oils for everything you may want to do, whether that is improve your mood, promote a good night's sleep, or increase your concentration or digestion. 2. What Do Essential Oil Kits Do? 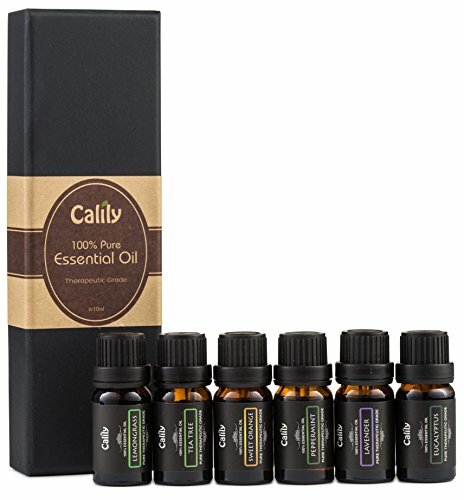 An essential oil kit usually contains a selection of the most popular essential oils, and some kits also contain blends or a carrier oil so you can create your own skin care products and massage oils. 3. How Do Essential Oil Kits Work? All essential oil kits include a range of oils, each which has a specific purpose. They can be used in diffusers, candlelit oil burners, or added to carrier oils and used on the body. Carrier oils must be are purchased separately and include oils such as almond oil. Some essential oil kits include blends of oils which contain ideal mixes of essential oils to deliver maximum therapeutic effects when used. Blends can also be prepared at home. All oils, apart from lavender, must be mixed with other carrier oils before applying directly to the skin, but all can safely be applied to clothes, or used in burners. 4. Where Can You Buy an Essential Oil kit? 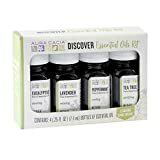 All essential oil kits can be purchased from alternative health stores and online through retailers including Amazon Online. 5. What Are Therapeutic Applications of Essential Oils? 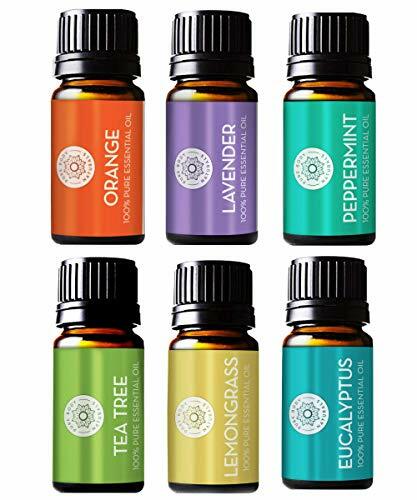 Individual essential oils have distinct therapeutic benefits, and the properties of the top six most popular essential oils are summarized below. Lavender - A natural sleep aid, used in a diffuser or directly on your pulse points. It is also a good anxiety antidote and muscle relaxant when blended with coconut oil or other carrier oil. Tea Tree - Used in many beauty products because of its fresh, tangy scent. It also can treat acne and its antimicrobial properties can be used in homemade cleaning products. It can even kill mold! Lemon Oil - Also great for cleaning products as it is a natural disinfectant. Food grade lemon essential oil can be used in baking for its distinctive citrus taste and health properties as it helps strengthen the immune system by stimulating white blood cells. Peppermint Oil - An energizing and refreshing oil which can be added to homemade soaps, bathroom products, and face masks. Also useful in clearing a stuffy nose or soothing aching muscles when combined with coconut oil. It can also be used for deterring insects and mice when combined with lavender and lemon oil. Cinnamon - A powerful anti-inflammatory oil, it can be used in a diffuser if experiencing respiratory problems. You can also use it in the kitchen in place of fresh cinnamon if it is a food grade quality essential oil. Rosemary Oil - This oil is a great natural stress reliever that decreases cortisol levels while increasing concentration. It can instantly create a more relaxed and focused environment and also be added to skin care products. This is a really useful oil to keep in the kitchen, if food grade quality, to replace fresh herbs in your savory dishes. The following products were reviewed based on the following parameters: Features, Pros & Cons, Price, Where to Buy, and Warranty. Customer watchdog sites and individual customer reviews were also noted when compiling this article and best of list. 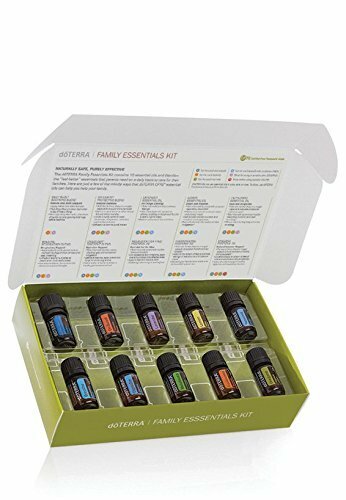 Essential oil kits range in size from 4 bottles to 14 bottle boxed sets, and prices range from $ to over $$. Prices do not only reflect the number of different oils in each set but also their quality and quantity. Key features of this product include a set of six 10 ml bottles, which are 100% pure and of therapeutic grade quality. This kit is made in Brazil although oils are sourced from all over the world, from Bulgaria, Morocco, Greece, and India. This kit unusually contains the rare and more expensive frankincense and eucalyptus essential oils. This set contains lavender, peppermint, eucalyptus, frankincense, tea tree, and rosemary essential oil. 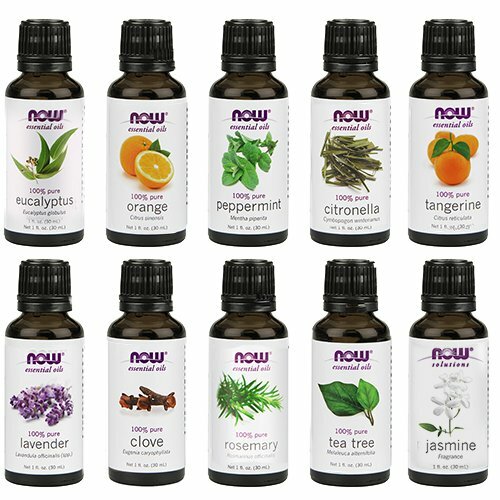 Key features of this product include ten 12 ml bottles of essential oils. These have been produced with no use of herbicides, pesticides, GMO products, or additives. Unusually contains cinnamon leaf which is great for respiratory problems, helps treat heart disease, increases blood circulation, and has antifungal properties. This set contains Cinnamon Leaf, Eucalyptus, Grapefruit, Lavender, Lemon, Lime, Patchouli, Peppermint, Rosemary, Spearmint, Sweet Orange & Tea Tree. Key features of this product include a six-bottle set which comes in a beautifully designed box suitable for giving as a gift. It contains frankincense essential oil, which is great for fighting chronic anxiety and stress, relieving pain and boosting the immune system, as well as being a natural astringent and sleep aid. 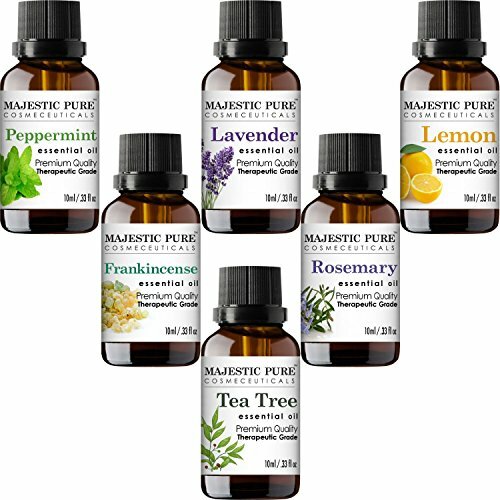 This set includes lavender, tea tree, rosemary, lemon, peppermint, and frankincense. 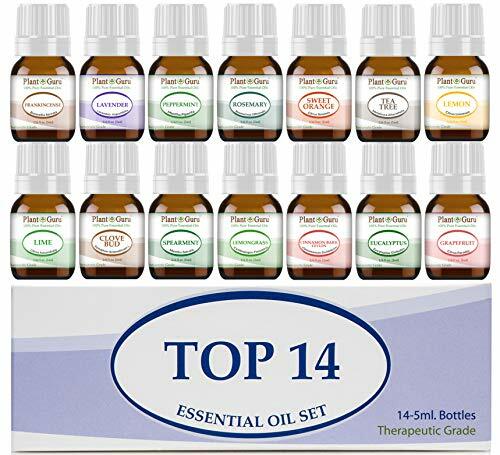 14 oils of therapeutic grade especially selected to assist in building and strengthening the health. This is an ideal set for beginners and includes eucalyptus which boosts the immune system by helping the body to fight infections and soothe coughs. Eucalyptus is the most effective essential oil to repel mosquitoes (as powerful as DEET) and even repels rats. 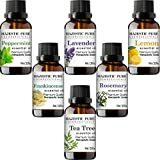 This set includes Lemon, Lime, Clove, Spearmint, Frankincense, Lavender, Peppermint, Rosemary, Orange, Tea Tree, Lemongrass, Cinnamon, Eucalyptus, and Grapefruit. Key features of this product include a beautiful gift box of these six 10ml oils, including lemongrass. Lemongrass is an effective repellent against insects, ticks, and lice as well as an effective treatment for sore throats, acne, relieving depression, and menstrual problems. Key Features of this product include 4 large 25 fluid ounce bottles which are made and sold in direct relationship from growers. This company is part of the Positive Change project which helps women move forward with their lives. Each kit comes with a guide to use each essential oil. The Aura Cacia set includes lavender, tea tree, peppermint, and eucalyptus. 10 oils in 1oz bottles unusually including the more expensive jasmine essential oil which is used to treat depression and insomnia. Jasmine, Citronella, Tangerine, Lavender, Peppermint, Tea Tree, Eucalyptus, Orange, Rosemary, and Clove. 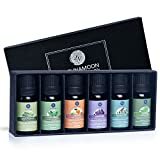 Key Features of this essential oil kit include ten bottles of 5ml essential oils and blends beautifully presented in a gift box. Special blends included are the digestive blend, respiratory blend, and calming blend. The doTerra family box includes Lavender, Lemon, Peppermint, Melaleuca, Oregano, Frankincense, Deep Blue essential oils, and doTerra Breathe, DigestZen, and On Guard blends. Key features of this product include six larger 10ml bottles in dark-colored glass which preserve their freshness. Their lavender essential oil is sourced from Kashmir and is much lighter in aroma than the lavender traditionally sourced from Bulgaria while the tea tree oil is sourced from Australia. Lavender (Lavandula angustifolia), Tea Tree (Melaleuca alternifolia), Eucalyptus (Eucalyptus globules), Lemongrass (Cymbopogon flexuosus), Sweet Orange (Citrus sinensis), Peppermint (Mentha piperita). 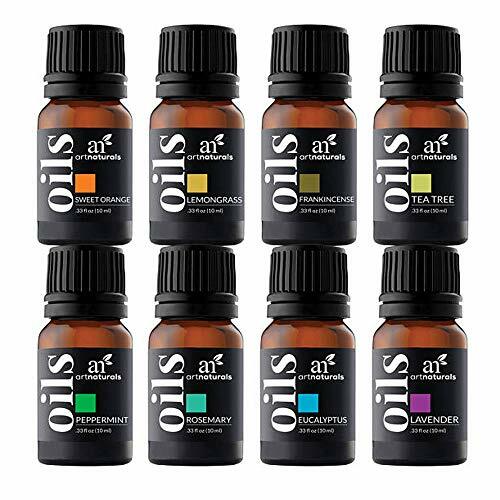 A key feature of this essential oil kit is that it includes six 10 ml bottles. This set of oils is externally verified by Essential Validation Services (EVS). This set includes lavender, lemongrass, peppermint, tea tree, orange, and eucalyptus. The Plant Guru Essential oil Kits are a great choice if you are a beginner and want to discover the most suitable essential oils for your personal needs before buying larger quantities. Well packaged and great value for money, these also make a great gift. 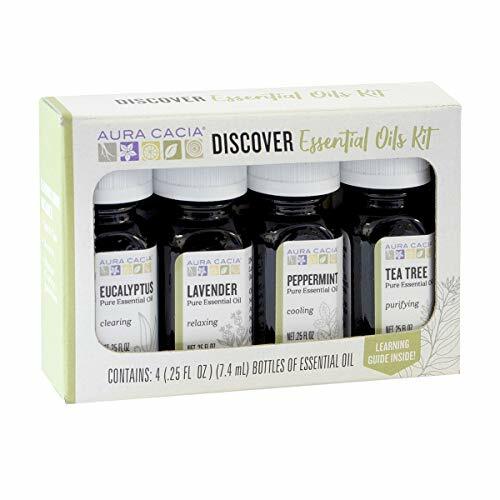 The Aura Cacia set of four larger 25 fluid ounce bottles of essential oils is a larger essential oil kit, better suited for the expert or professional. They are superb quality oils in a handy bottle with a dropper included. These products have the additional benefit of buyers knowing their products have been both ecologically sourced and are coming from a reliable manufacturer who is working with international programs which are designed to help women change their lives for the better.